Yerry Mina’s 74th-minute header at the Samara Arena this afternoon turned Group H on its head with Japan also going as runners-up through despite losing 1-0 to Poland. Senegal and Japan finished the group with an identical record of points, goal difference and goals scored, with the former knocked out by virtue of having accumulated two more yellow cards. 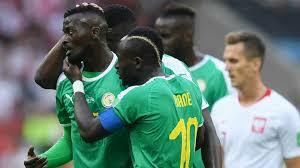 It means there is no African country in the knockout rounds of the World Cup for the first time in 36 years. Davinson Sanchez came to Colombia’s rescue several times before the break, although the Tottenham Hotspur defender’s first major contribution initially resulted in a penalty being awarded to Senegal on 18 minutes. Intervention from VAR saw referee Milorad Mazic overturn his original decision, with the replays having shown that Sanchez had expertly taken the ball off the toe of Sadio Mane as the Liverpool winger ran through on goal. Sanchez thwarted Senegal’s star man again on 26 minutes after Mane had skilfully turned away from Mina. Keita Balde Diao picked up the second ball but his curling shot was easy pickings for goalkeeper David Ospina. Colombia were being pushed back against the ropes and suffered a big blow when they lost James Rodriguez, who has six goals and four assists in seven World Cup appearances, to a calf injury just after the half-hour mark.